Karen B. taught an excellent class on knowing our children and how to effectively work with our children to achieve their potential. She started the class by reading from Elder Ballard’s April 2008 general conference talk about women, “Daughters of God”. That is so true! With that perspective, I can focus on what is most important now and still have time in my life to do those other things on the not-so-high-of-a-priority list later in my life! So, focusing on my kids. . . Karen gave some good tips. She highly recommended PBS.org. Go to the parent section. There is a wealth of information and helps available. We concentrated on developmental milestones. Karen gave us a handout with milestones from University of Michigan. The church also has a great list of what to expect and suggestions at each age. Karen puts together a notebook for each of her kids. She includes a list of appropriate milestones for the child’s age. She also includes a chart listing the child’s “strengths,” their “reinforcements” (rewards that work for that child), “areas of focus” (a.k.a. weaknesses, but no one likes to see their weaknesses spelled out on paper), and “notes.” She can also put any thing else she needs to in the notebook. With this information readily available, she is able to take an active role in the upbringing of her children. She knows when they are developing as they should and is able to recognize areas of concern quickly. These notebooks are also good for Dad to get a quick glimpse of his children’s lives. Karen keeps in mind the areas of focus as she parents. One child needs to work on handwriting, so Karen will encourage the child to write to cousins–a great idea anyway and it helps the handwriting without even mentioning it’s an exercise. Karen takes her kids on fieldtrips–a lot of fieldtrips! She said she likes to do one to two a week! But before I could get really nervous about considering that option with my kids, she explained that some of these fieldtrips are to Albertson’s. She has one child putting together a dinner menu on a budget and another child is responsible for finding a food for each food group. Other fieldtrips ideas are walking along the river (she said that there is an exotic animal farm with llamas, ostriches, and two camels! ), Dion’s Pizza tours, Albertson’s bakery (they have tours too), and of course all the museums. Firehouses and police departments also give tours! Use your imagination! Karen gave the great idea of using the talents of our fellow sisters–quilting, learning about homing pigeons, art appreciation, computer skills, etc! Maybe they would be willing to teach a class about their hobby to our kids. When planning for the summer, Karen sits down with her kids and they work together. She asks her kids what things they would like to do this summer that are free. They make a list. Then she asks what is one thing they would like that costs money. And then she asks what projects need to be done. All of these things are considered and plans are put on the calendar. When calendaring, they first put church responsibilities and family events, like FHE and other activities. Then they can fill the calendar with the other things in their life. This way, the important items are not lost in the busy-ness of life. Karen pointed out that it is very important to FOLLOW THROUGH on what you plan to do. This is so important in building trust with your children. This is even more important with young children so that they will be able to trust you when teenagers. So, if you don’t really intend to do it, or if you really won’t be able to do it, don’t put it on the calendar! I really enjoyed this lesson! It was what I needed to hear. Thank you so much Karen! Just so you know, I made cookies with my boys today. And I didn’t even get upset when one of them accidentally flicked flour all over the kitchen! I love Independence Day! I love the pancake breakfasts, the primary parades, the picnics, the family time, and of course the fireworks. But more than this, I love what the day means. I love my independence–I can be who I am, say what I think, live where I please, worship my God, . . . I can make my own choices. I love my independence. Of course, with the independence, I also take on responsibility. And when I make mistakes, it’s not always easy to shoulder that responsibility. But I’m grateful for the opportunity to learn from my choices, whether they be good or bad. I’m so grateful to be free! I know that freedom came with a price. I have a brother-in-law located somewhere in Afghanistan. I have another friend somewhere in the skies on the other side of the world. My father and grandfathers enlisted and did their duty to this great country. And their families paid the price too. I pray throughout the day everyday for my sister and my friends who eagerly await the return of their spouse, father, brother, and friends to return safely. And for those who don’t return, my prayers and heart go out their families even more. Thank you America! Thank you to all those who make my independent life possible. God Bless America! Happy Birthday! I was just called as the Enrichment Leader in my ward. I have to admit, I’m really excited about this calling. I have been in many wards and have seen how the enrichment activities can really make a difference. We have a lot of talent in our ward and I plan to encourage those lights to shine–we can all learn from each other. I’m hoping to share that light (with permission, of course) on this blog so that the light isn’t limited to just those who come to the meetings. So, there will be enrichment spotlights coming soon! I hope you enjoy. . . I just found a great website for do it yourself information. Though there is a ton of written info on the web, a picture is worth a thousand words, and a video is worth a whole lot more than that. It’s called ExpertVillage.com. It’s the worlds largest how-to video site. I noticed there were subjects such as How to Bake a Traditional Challah Bread, Introduction to Bass Guitar Basics, Eyebrow Waxing: Hair Removal Tips for Home Spa Treatment, How to Raise Baby Chicks, How to Plan A Dinner Party, and Ankle Dribble Technique: Beginning Soccer Drill. That’s quite a range of topics. There must be at least one that would interest you. So check it out! 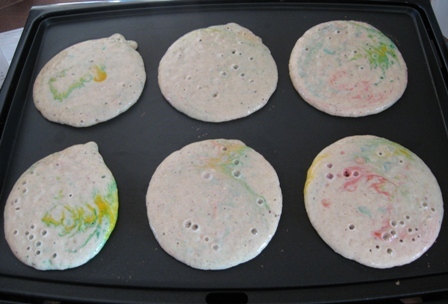 Note: Do NOT stir the batter very much after you add the dye. Otherwise you will end up with unappetizing gray batter.